I love having the opportunity, every day, to improve the lives of my patients. By correcting bites and creating a beautiful smile, I ensure patients have stronger oral health and greater self-esteem. My father is an orthodontist. Since I was in high school, I knew I wanted to do what he does. He inspires me, especially seeing his patients being thrilled with their new smiles. I truly love my career, and thrive when I am able to help my patients to smile with confidence. Each year, Dr. Diaz takes many hours of continuing education (CE). 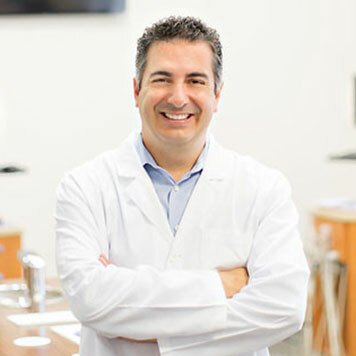 He is committed to providing the highest standard of orthodontic treatment, and CE enables him to stay current with the latest technologies and approaches, which he incorporates into his patients’ care. Dr. Diaz regularly attends general orthodontic seminars, as well as seminars on temporary anchorage devices, Invisalign®, and dental lasers. Happily married, Dr. Diaz and his wife have two wonderful girls, as well as a Cocker Spaniel and a betta fish. His family is everything to him. They enjoy their time together and with friends. The family likes to go to the movies, attend Orlando City Soccer Club games, and pursue many outdoor activities. Dr. Diaz enjoys staying active, as well, and can often be found running, playing tennis, or playing soccer.